Luxury Experience Magazine met pastry chef Stefan Gerber of Badrutt's Palace at the 15th St. Moritz Gourmet Festival in Switzerland in January 2008 whose gorgeous pastry creations dazzled the senses. Chef Stefan Gerber and I have a lot in common, we both love creating pastry, which when done properly is a true art form. Speaking with Chef Stefan Gerber I immediately knew that he is passionate about pastry and its creative presentation, and when he spoke about his coconut ravioli with pineapple soup that I had savored, his blue eyes twinkled in excitement as he described it to me. He grew up in the world of pastry, his parents owned a patisserie in the Rhineland, and he immersed himself in perfecting his craft. Today fortunate guests in St. Moritz have the opportunity to taste his creations. 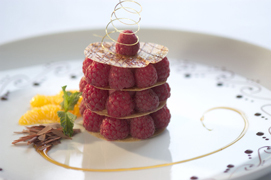 He graciously shares his recipe for a beautiful Raspberry and Champagne Millefeuille. Method: Boil the raspberry pulp with the sugar. Mix the eggs together and combine with the raspberry and sugar to make a cream. Add the butter to the cream. Then add the gelatin leaves and Raspberry Liqueur. Allow the cream to cool, and then add it to a piping bag. Using the piping bag, pipe the filling between caramelized pastry sheets and decorate with fresh raspberries. Method: Boil the water and add the gelatin. Then add the bottle of champagne and freeze the mixture in an ice cream maker. For the finished dish, prepare a nice ball of sorbet and place it next to the millefeuille. Method: Boil the sugar until it caramelizes, add the fresh orange juice and reduce it over a low hear until it turns to a honey consistency. Brush the pastry leaves with the caramel sauce.